The following Brief History of Nelson was compiled from Rick Church’s opening comments at the Nelson Community Forum, held on September 17 and 18, 2010 at the Apple Hill Center for Chamber Music. 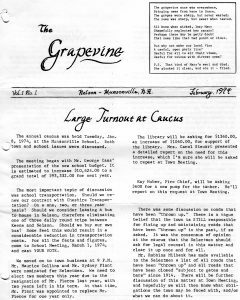 A link to the Forum’s full report is attached at the end of this article. 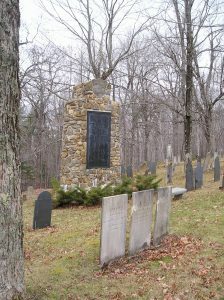 Almost 260 years ago, on December 6, 1751, the Masonian Proprietors granted Monadnock Number Six to a group of men who would have the direct responsibility of settling the town. Breed Batchellor was the first settler arriving in 1767. There seems to have been at least three settlers that year. Batchellor built the first sawmill on the brook that empties Center Pond just downstream of the bridge on Center Pond Road. Daniel Woods was enticed to build a gristmill at the outlet of Pleasant Pond, later Breed Pond and now Silver Lake. Monadnock Number Six was incorporated as Packersfield on February 22, 1774, named after Thomas Packer, high sheriff of New Hampshire and patron of Breed Batchellor. Batchellor declared himself a Tory during the Revolutionary War and was forced to flee to Canada. 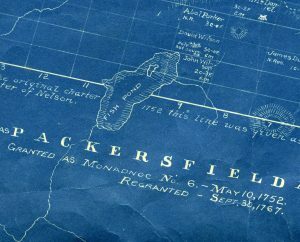 Packer died in 1771 and probably never visited the town named after him. Many Packersfield men served in the Revolution and many more veterans settled here after it. They came from New Hampshire, Massachusetts and Connecticut. All were newcomers in those days. From 1767 to 1790 many miles of roads were built as were many homes and a number of mills. The town was pretty self-sufficient. It could mill its own boards, grind its own flour and tan its own leather. Fields were cleared and stonewalls built. 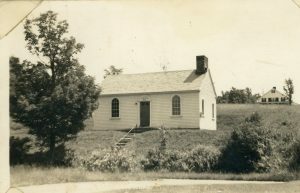 We had a 40’ x 60’ meetinghouse and a schoolhouse. We had our own doctor, cordwainer, housewright, cooper, blacksmith, tavern keeper, mortgage lender and potash maker; these professionals also grew much of their own food. The town would soon build eight more schoolhouses. In 1790 the first US Census recorded 721 inhabitants including a family of three free blacks. Immediately we began to try to change our name. After trying for Sullivan, Groton and Troy, we became Nelson in 1814. Some family names haven’t changed. The Tolmans are still here as are the Barkers (we know them, today, as Walters), Farwells (Frenchs), Hardys (Struthers) and Robbins (Warners). They came early and are still here. Willie Guillow arrived in 1902 founding the community some still call Guillowville and the Hutchins family in Nelson. Not everyone wanted to be part of Nelson. Sullivan left in 1787, but almost no one was living in that part of town anyway. 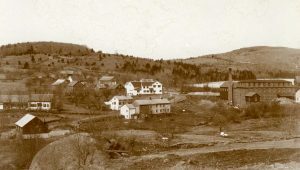 Roxbury formed its own community from parts of Keene, Marlboro and Nelson in 1812. And Harrisville formed its own town out of parts of Nelson and Dublin. The split came after both Dublin and Nelson refused to vote a substantial subsidy for the railroad. It wasn’t all bad news, however. The Tarbox family felt more connected to Nelson and their small part of Stoddard was added to Nelson in 1835. Munsonville was settled later, well after the Revolution, but its position astride the town’s most powerful fall of water soon made it Nelson’s economic engine. The Nelson Cotton and Woolen Company was founded at the outlet of Granite Lake in 1814 to make cotton cloth. Alvin Munson bought the mill in 1832 and, by 1850, twenty employees were producing 55,000 yards of cotton cloth. The name of that part of town soon changed from Nelson Factory to Munsonville. 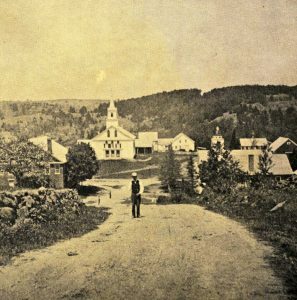 A new road being constructed from Keene to Concord was built through the growing village in 1830. That road played a major role in the history and economy of the village from that time to the present. Downstream of Munsonville, Frederick Taylor employed four men in his chair shop where they made 8000 chairs that year. These two men were clearly shipping their products beyond the borders of Nelson. The hill farms established by those early settlers failed early. City Hill was first farmed in 1768 and, by the Revolution, ten families had settled there. There was no one in residence by 1840. Most of those people had moved to New York State and Ohio for better land. However, farmland remained open for a while as abandoned farms were consolidated to graze sheep. In 1836 Nelson was the leading sheep raising town in the state. The early center of things was the first town common where the Nelson Cemetery is now located. It featured a meetinghouse, school, store, pound, tavern, cobbler shop and burying ground. A rival center in Munsonville was built around the mills and Union Hall, now Chapel by the Lake. In the late 1830s Nelson village moved down hill to its current location and featured a new brick school, church, town hall, cobbler and blacksmith shops, the Melville-Nims brick store and most of the houses there today. The Civil War saw a soldier representing virtually every family in town. Nelson ran up huge debts for bounties to encourage men to serve and for the support of the families of those serving. The few remaining farmers turned out great quantities of wool to support the war effort. It was a time of great patriotism, economic vitality, but horrible human toll. Twenty-nine Nelson men died and thirty-two more were wounded. Nelson was approximately the same size then as it is now. Imagine the impact of so much loss. 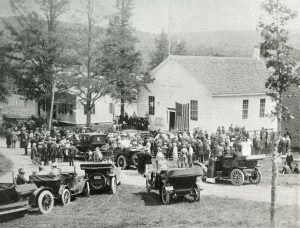 The post-Civil War era saw a dramatic decline in New Hampshire farming communities; Nelson’s population declined to 295 by 1900 – one third of its earlier peak. Summer people helped the town move forward. The telephone arrived early (1895) courtesy of William Henry Elliot who transformed the former Town Poor Farm, now Lead Mine Farm, into an elegant summer home. 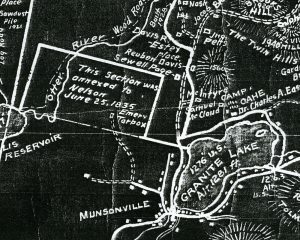 The line was run from the state road at Munsonville through the village and out Lead Mine Road. Not to be outdone, the Tolman’s of the day established the Tolman and Long Pond (Nubanusit) Telephone Company to serve that end of town. Summer residents began to build homes around and overlooking our lakes. At about the same time, Olivia Rodham brought a group of intellectual friends to Nelson from Pennsylvania. Members of this group donated a public library in Ms. Rodham’s name. Some of their descendants have made Nelson their home. Art and music have a long tradition in Nelson. We can think of artists like Albert Quigley and Margaret Redmond, writers like May Sarton and Newt Tolman and nationally known contributions to classical music in the form of Monadnock Music and Apple Hill Center for Chamber Music where we meet tonight. “Tuesday, March 13, Town Meeting Day. Very windy. 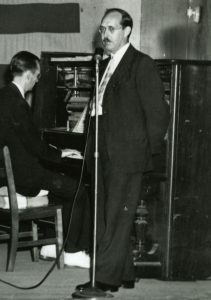 Was elected, selectman 33 to 28, defeating Harry R. Green, one of the “old guards” of the town. Marguerite was elected a member of the school board 43 to 11. Slowly but surely the defenses of the old conservatives are crumbling away before the attack of youth and progressivism. Community has had times of greater and lesser emphasis in Nelson. In the early days the church was the town’s community focus when the meetinghouse was built by the town and the minister was paid by the town. 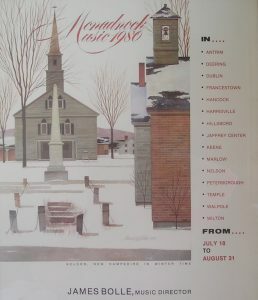 In 1819 that changed when the Toleration Act was passed in New Hampshire requiring that churches be privately supported. In 1875 a Basket Picnic was held at the home of Noah Hardy. The year of 1878 is remembered as the first Nelson Picnic; we now know it as Old Home Day. 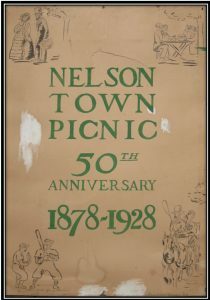 The Nelson Picnic Association was formed. As usual Nelson led the way, and twenty years later the governor issued an Old Home Day Proclamation for the state. We had our 131st Old Home Day about a month ago. We are a town whose roots go back 260 years. Some of our early founding families are still here and new ones have added their contributions since. We may be different from what we used to be, but we’ve always had a strong sense of community as witnessed here tonight.